US Box office in year 2015 has not only proved to be money spinner for movies like Baahubali and Srimanthudu, but also turned out be disastrous for films like Akhil and Bruce Lee. The first film that comes in this list is Akhil. It managed to create a lot of hype before the realease itself, as it is the debut film of hero Nagarjuna’s son akhil. This movie flop proved that, no matter who the hero is, if the film doesn’t have a story in it, it will become a flop. After that, Brucelee starring “Mega power star” Ram Charan that was released with the highest number of prints became an utterflop. The film didn’t manage to impress the audience inspite of the film hero Ram Charan’s action and the beauty of Rakul Preet singh, the film’s heroine. In fact Telugu cinema boomed in Overseas in 2015 with successes like Baahubali, Srimanthudu, Bhale Bhale Magadivoy, etc. However, we have seen disasters also like Ram Charan’s much hyped ‘Bruce Lee’, which was expected to gross over $ 2 million but grossed $641,084 only and Akhil Akkineni’s debut film ‘Akhil’, which grossed $168,273 despite huge release. 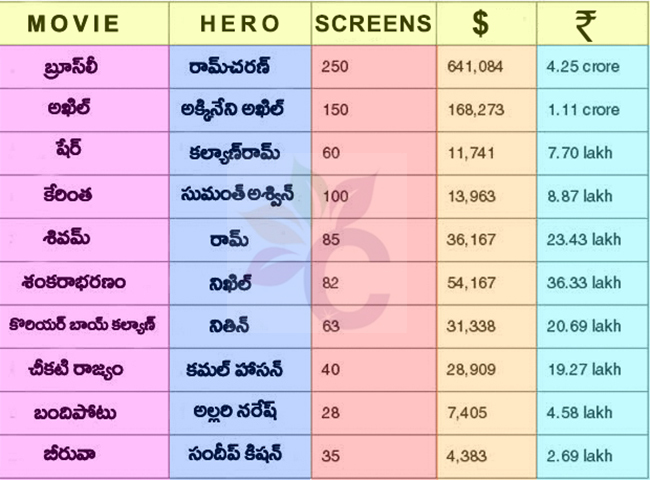 Have a look at the chart for top 10 flop Telugu movies at USA box-office for the year 2015.